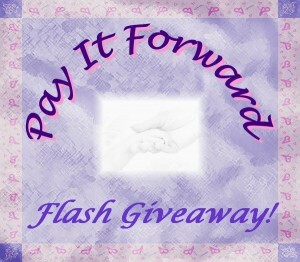 Powered by Mom Blog is part of the 4hr Flash Giveaway! 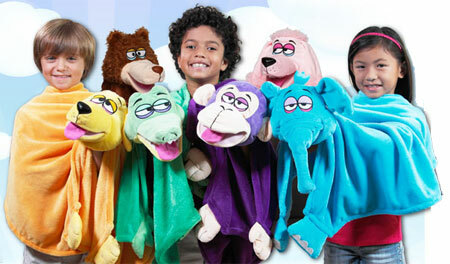 CuddleUppets- Blankets that are Puppet! Play all day and Sleep the night away! 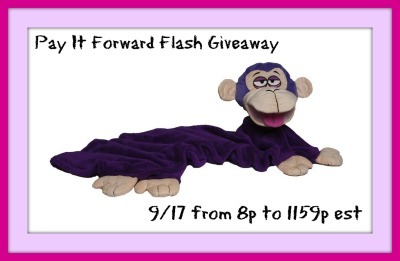 One lucky winner will receive the Purple Monkey CuddleUppet! and then at midnight we pick a winner! I really liked my Pillow Pet and my Bedtime Bear. the stuffed animal you could roll it into a ball and stuff it back into itself! Multi purpose toy like the cuddlepets! A raggedy Ann doll as tall as I was! Could you email me your secret to getting over 13,000 in 4 hours. That is amazing! I have a pale yellow blanket with that soft satin trim around it. I literally wore it to almost shreds! I kept it for years even with it threadbare and holey. My mom finally got a hold of it and cut out the part that wasn’t too threadbare (about a 7×7 piece) and sewed some new satin trim around that piece, found a cute little poems and framed it for me! my doll. I used to do everything with her. Would be a great present! Thanks! Heather and any of the other entries you want to do make sure you clicked on the rafflecopter! Icollected stuffed elephants when i was little. They were my favorite! I had a small quilt as a child that I loved so much. It was shredding to pieces but I still loved it. One day it was gone. My mother threw it out. I had a blankie and still have it! My kitten/cat Tiger. I got him when I was 2 and had the measles. I had a giant stuffed panda that I loved. I always had soft bunnies to snuggle. my orange bear named maggie. she had little hearts on her tummy and i couldn’t sleep without her.i still have her! I had twin dolls I loved. One had a happy face with straight hair and the other had a pouting face with curly hair. I ended up giving them away to two needy girls that lived locally. My favorite stuffed animal was a Lion! I still have it to. My favorite was a stuffed kittie I named Mimi. my favorite stuffy was a little pink bear that my papa gave me it was just a generic little pink bear I had him all my life.! a stuffed cat was my fave. i had a holly hobby blanket when I was little. I had this beat up looking teddy bear. I sewed that thing up so many times. I had it for years. It went missing, well I’m not even sure when. I miss it to this day!! My favourite was “George” the stuffed monkey with a banana in his hand! My favorite was my Buddy doll. My Barbies were my favorite thing….carried them around in a suitcase. My favorite toy was a squeekie doll. I liked Barbies a lot. I loved Carebears and Huggabunch! I had a small monkey but I wedged it into the gutter of our old house right before we moved. His name was little guy. I had(and still have) a stuffed dog. He used to have a radio and when it broke we took it out and I would keep my “treasures” in there. A white teddy bear I named Polar Bear. I had a little gray mouse, and I just loved it. I think I still have it somewhere. I had a stuffed monkey. His name was George because my favorite uncle George gave com to me when my sister was born. My favorite toys were my baby dolls. I had a favorite stuffed animal, a white teddy bear. My favorite stuffed animal as a child was a stuffed skunk! Yes, it was a skunk and I miss him so much! My favorite blanket as a kid was a light pink blanket that my grandma made me when I was a baby. I carried that thing everywhere! I liked my Barbies, I don’t remember having a favorite blanket or stuffed animal. When I was growing up my favorite stuffed animal was my scooby doo. I still have him to this day!